It is that time of year again- The nights are drawing in, the clocks have gone back, and we are starting to think about digging out winter coats out of the wardrobe. It also means it is time for the annual leaf busting operation on the UK's railways. This means Network Rail's fleet of sandite and water cannon vehicles are kept busy as they keep the rail network clear. On the Southern region we are used to seeing the fleet of MPV (Multi Purpose Vehicles) running these trains- however this year some turns have gone over to loco haulage with several circuits based at Tonbridge and Horsham using traction provided by GBRf. 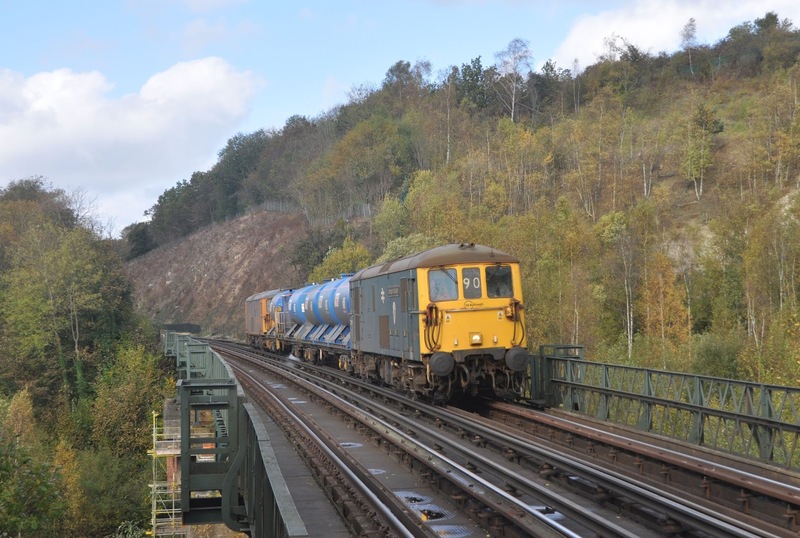 On Sunday 19th October BR blue liveried 73119 and GB 73213 were set to work on a Horsham based train which would visit East Grinstead and Uckfield among other locations. The train is seen here as it crosses Riddlesdown viaduct on its way to East Grinstead- a location I have wanted to visit for several years!